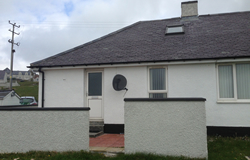 Eriskay Self Catering is a 3 bedroom semi-detached cottage that sleeps 6 very comfortably. The cottage is fully furnished and has everything you need to make your holiday more enjoyable and relaxing. It is situated in a very central part of the Isle of Eriskay as the local shop, Co Chomunn Eirisgeidh and the local bar & restaurant Am Politician are a 2 min walk from the accommodation whilst St Michael's church is a 5 min walk. The cottage has beautiful scenery of the island and its beaches are all within walking distance. There is a regular bus service to the neighbouring island of south Uist and the Barra ferry therefore a car is not essential while you are on Eriskay. Towels and bed linen supplied provided.